Check out Sensopart's Generation 4.0 smart & high-end color sensors with an intuitive LCD display, IO-Link, comprehensive functions for diverse application and excellent sensor characteristics. This compact color sensor is extremely versatile and easy to use and is therefore ideal for diverse color detection and sorting applications. 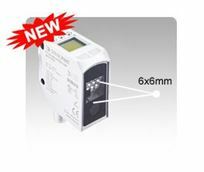 The FT 55-CM color sensor offers a scope of functions and level of user-comfort that are unsurpassed in its performance class. The wide operating range – independent of distance – combined with the flexible color detection feature gives a diverse range of applications. The large integrated LCD display and remote configuration via SensoVisual and IO-Link set new standards in ease of use and connectivity. This unique combination of characteristics makes the sensor ideally suited for challenging color detection and sorting tasks, for example in machine construction and in the automotive, plastics, pharmaceutical or packaging industries.